Temple, stucco reliefs in metal on wood from the church of Catalonia, Spain. 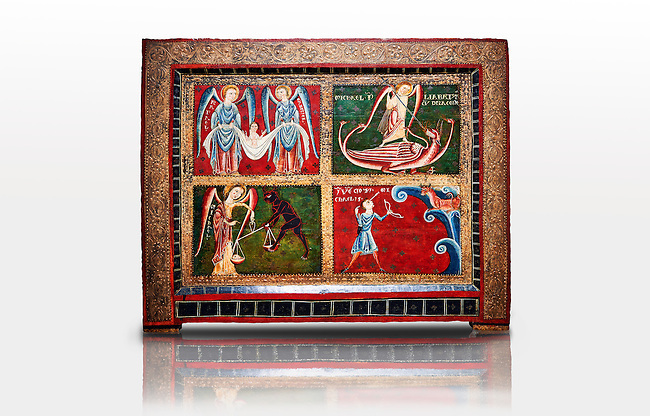 Archangels were prominent in Romanesque iconography, acting as intermediaries between God and Man or as agents of divine will. Three of the four compartments of the small altar front are dedicated to San Michael. Top right shows Michael fighting a dragon, bottom left shows the psychostasia, where souls are weighed to determine whether they should go to heaven or hell on judgement day, bottom right shows a detail of the story of the miracle of Mont Gargano. Top left shows Grabriel and Rafael with the baby Jesus. The style of the painting is the similar to the mural decoration of St. Paul Casserres.